Is Tim McGraw talking about starting a career in politics? It's true! The country star has tried his hand in film and writing children's books -- now Tim is ready to run for office! The New Republic magazine is reporting Tim McGraw is serious about making a run for the Tennessee governor's office in 2010. Of course, this is not a first for the entertainment industry -- Ronald Reagan was a Hollywood actor before he became Calif. Guv and later President. Other celebs who left showbiz for politics include former pro wrestler Jesse Ventura and Gov. Arnold Schwarzenegger. 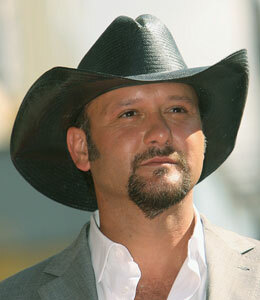 The multi-platinum-selling McGraw has over 10 albums under his belt, but no political experience. Tennessee Democrats are desperate for a high-profile candidate to take on to take on Bill Frist as the successor to Democratic Gov. Phil Bredesen.